Everyone is looking for a new look now that the seasons are about to change over. How about this amazing braided hairstyle created by the good people from Aveda? If you know how to do a fishtail braid, you are halfway there. I’m going to try this look on Natalie. It is perfect for both women and young girls! STEP 1. Prep hair with Aveda Pure Abundance™ Style Prep™ to give hair some texture and grit. Blow dry hair straight. STEP 2. Create a clean center part from forehead to nape using a tail comb. STEP 3. Make an inverted fishtail braid on each side of the head, beginning at the crown and working to the back of the ear. Secure the end of each braid with an elastic band. STEP 4. 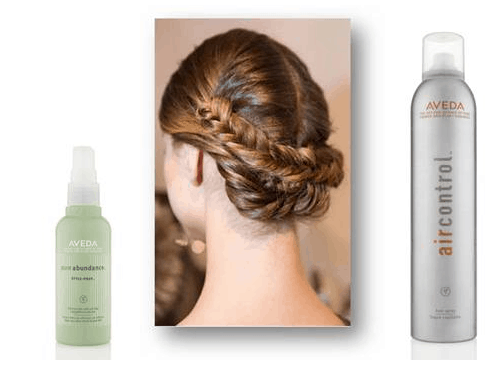 Tame flyaways with Aveda Air Control™ Hair Spray. STEP 5. Add some fullness by gently massaging braids. STEP 6. Fold the braids over one another across the back of the head, just above the nape, in a crisscross fashion. Tuck ends under and secure with bobby pins. STEP 7. Finish with a misting of Aveda Air Control™ Hair Spray.